When I first met the Lemon Lime Bitters (LLB) at the Italian restaurant Grano, Wetherill Park I was captivated by its vibrant citrus tang. The colour of the mixture is just right; and I don't write that lightly. You can see that this bartender has created the exact ratio for enough tang with the orange of the bitters and the fizziness of the lemon and lime cordials. 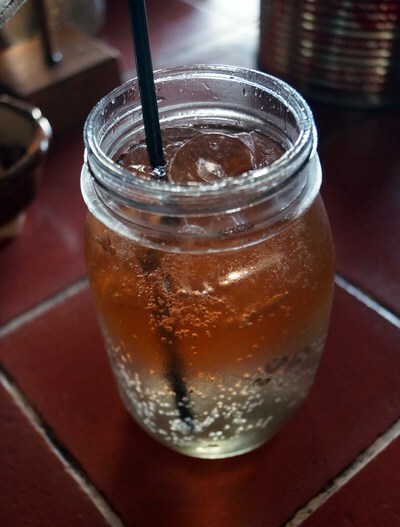 I do like the revived use of the jam jar as a way to serve drinks, however I wonder if this is a long term decision. And I wonder what my nonna (grandma) would think as she is used to drinking from conventional glasses! Kudos goes to the bar staff for their skill, although it is best to time when you order your drink. This restaurant is nice and intimate, which means that sometimes drinks are not the main priority. All that is missing from this drink is a lovely slice of fresh lemon or lime atop the rim. For under $10, I'll certainly be back, whether its Summer or Winter.